A year ago I did a video (you can watch it below) where I talked about that I wanted to step back from the Internet and live my life instead. Do what I like and be with my family. And I sure did, and I am still quite productive. One of the things I wanted to do was reading books. Books are one of my biggest interests, and before this decision, I never had the time to read books. 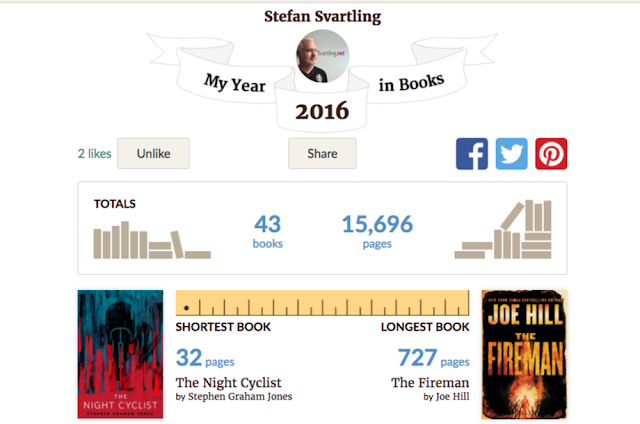 But after this decision, I have read 43 books this year. While I’m still have done both YouTube videos and Blog posts. I don’t hang around on social networks anymore. Of course, I still reply on comments I get on my posts, but I don’t “read” Twitter, Facebook or Google+ anymore. I read books. I get the news about new things I am interested in delivered to my inbox instead. So I don’t have to waste time scrolling through my newsfeeds anymore. I use services like Google Alerts and Nuzzel for that to happen. This saves a huge amount of time. Trust me. To be able to read so many books I use my own “speed reading” technology because no other speed reading technologies actually works because with those technologies you get a terrible comprehension. With my technology, you get excellent comprehension. I have explained my speedreading technology in two videos that you find here and here. These two things have made it possible for me to still be productive and create content for the Internet, while still having time to enjoy life being with my family and read books that I love so much.